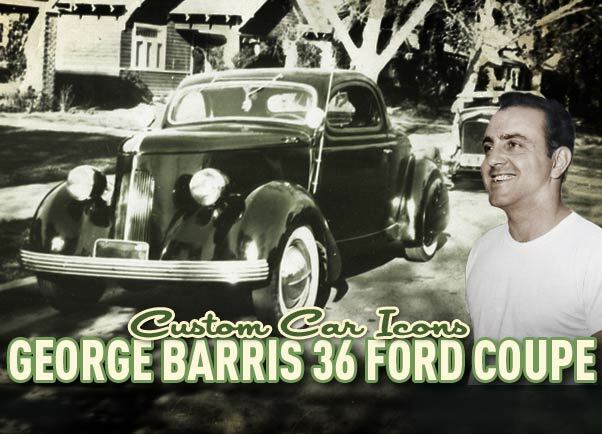 George Barris created his first full Custom, a 1936 Ford Coupe, while he still lived in Northern California and worked part time at Harry Westergard. In the very early 1940’s George Barris, still in school, spend all his spare time he had at local body and fender shops. Looking at the craftsman repairing cars. George became well known at these places, and after a while the guys at the shop started to answer all his questions and even showed him how to do the work. Eventually even letting him do some of the work. This is what really got George started. One of the shops he visited and the one he liked the best, was the small shop of Sacramento pioneer Custom Car builder Harry Westergard. George learned a great deal from Harry, and Harry allowed George to do a lot of work for him, and also let him work on his own car using the few tools he had in his shop. This is the only published photo we have been able to find of the George Barris 1936 Ford Coupe. The first real full custom George Barris created for himself was a 1936 Ford Coupe in 1941. It shows a typical Nor Cal style we often associate with as the Harry Westergard Style. Long, sleek, high small nose and a speed boat stance. We do not know much about this car, sadly only one photo of the car was ever published. The May 1953 issue of Hop Up magazine showed a very small photo of this very first George Barris full custom in the Barris Story article. We assume that at this time George did not take many photos, and possibly he only took this one snapshot of the car, when it was just finished. By the time the magazine article was done, in early 1953, the car was long sold and George most likely had no idea what ever happened to it. The Ford sported a beautiful proportioned chopped top. George had removed the running boards, and hand shaped frame covers were added below the body to fill the gap where the running boards used to be. The back portion of the front fenders were extended where the holes for the running boards used to be and the lower portion completely reshaped. The front section of the rear fender was also filled in and covered with a stainless rock shield. The stock grille was removed and a new panel was either hand shaped from sheet metal, or possibly an early aftermarket part was used for this. The result was a narrow grille which made the front of the car look very tall. Stock bumpers were replaced with 1941 Ford units, and according the text in the Hop Up magazine modified the taillights and set in the license plate. The car was lowered with a nice speed-boat stance and the wheels were dressed up with single bar flipper hubcaps. A set of Spotlights was mounted on the A-Pillars and a large antenna – big trend in those days – mounted on the cowl. 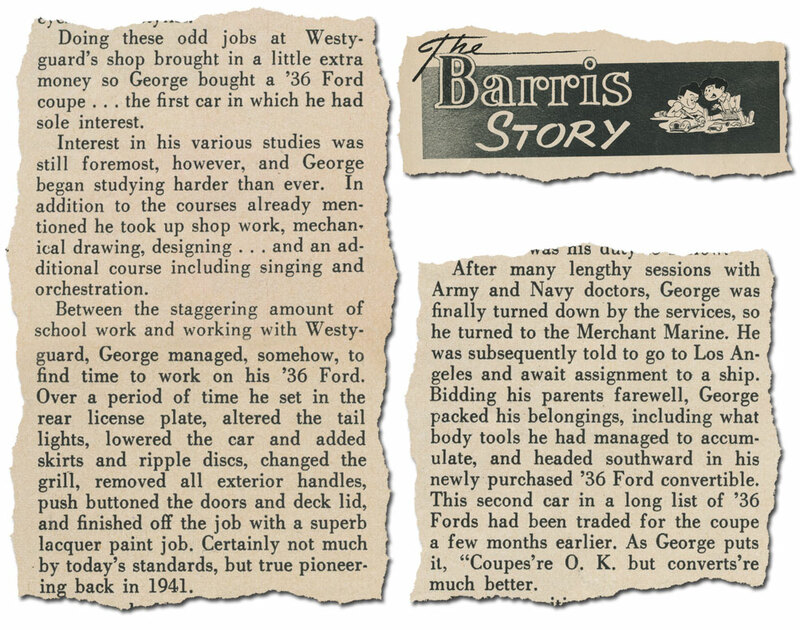 The May 1953 Hop Up magazine The Barris Story is, as far as we know, the only time a photo and write up of George his 1936 Ford was published. The text in the Hop Up magazine is not always accurate, and also on describing George his ’36 Ford they mention that the exterior handles were removed, while the photo shows clearly the door handles are still in place. Something quite common for the years the car was built, but when the article was written , 1953, it was more common to shave the complete cars. George used his Coupe for daily transportation for some time, but he had always liked the more expensive convertibles better than coupes. He figured that when he would sell his finished coupe custom, he would have enough money to get a convertible as next project. And that is exactly what he did. 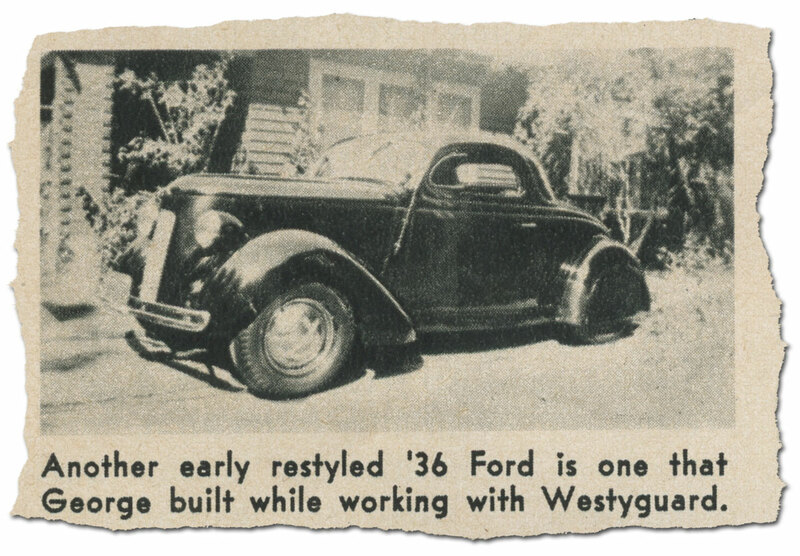 The 36 Coupe changed hands and George bought a 1936 Ford convertible which he immediately started to restyle while he was still working part-time at Harry Westergard. Ron Brooks shared this photo taken in the mid 1940’s. the Coupe has been updated with a set of white wall tires an the ’41 Ford bumpers had been replaced with more elegant 1937 DeSoto units. 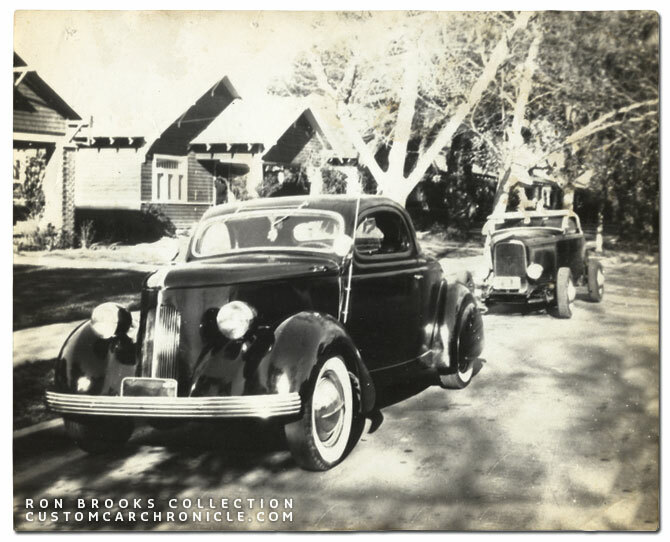 A few years ago, Nor Cal Custom Car enthusiast Ron Brooks shared a few old photos from his collection and on one of the photos there was this same 1936 Ford Coupe again. This time it was updated with a set of wide white wall tire, and the bumpers had changed to 1937 DeSoto units. Sadly Ron had no info on the cars in the photo, only that the photo was taken in Northern California in the 1940’s. We are not sure if George Barris still owned the car at this time, or that it belonged to a new owner, who had bought it from George around 1942-43. Although this 1936 Ford Coupe never really got much publicity, we think it really is an Custom Car Icon… it is after all George Barris his first full Custom Car he created. It is the car that started his career. It would take a few more years, till 1948 to be exact, before George Barris would get the full recognition for the custom restyling he was doing with his 1941 Buick Convertible. The publicity he got with that Buick made him well known in the whole country, and the business bloomed. But the 1936 Ford coupe in this article is what started it all, and the way it came out assured George would all be all-right! 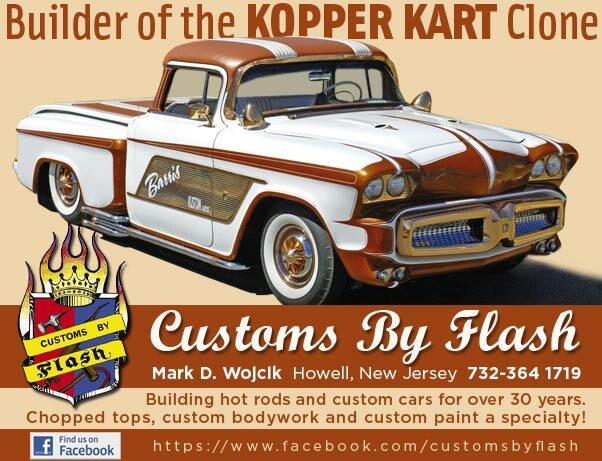 The Kustom that started it all…. Westergard style ” The Mentor ” Barris ” The new kid on the block “…….. The pines winter front grille 1936…….. Looks to be one of George Barris’s first kustom Grilles…….Awesome…! Love how the spelt Westergard’s name as ” Westygard ” in the 1953 issue of HOP UP Magazine.